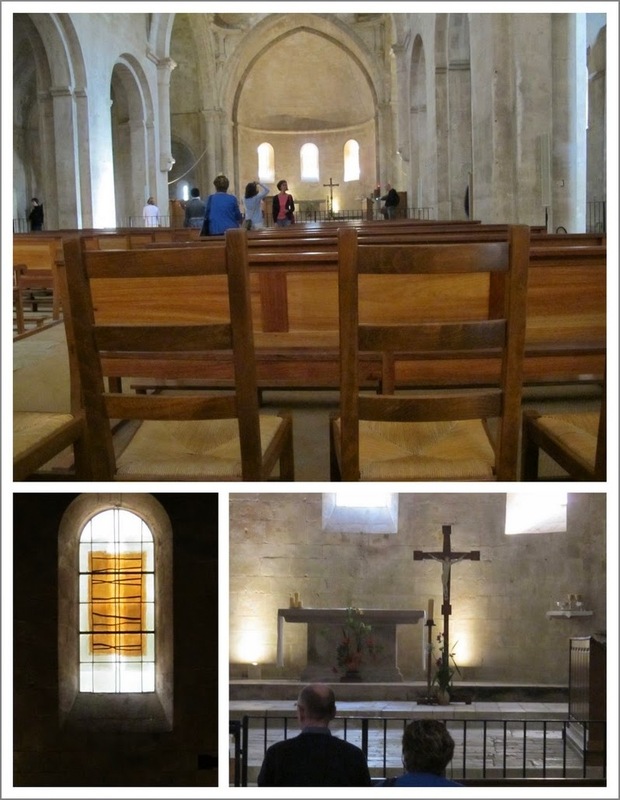 I made two visits to Abbaye de Senanque this trip, the first on 29 June and the second on 9 July. Both lavender and people crops were more abundant on the latter. It seemed quiet and peaceful when we arrived the first time. Parking was beginning to become a hassle by the second. The French will fill diagonal parking first, then make a straight row down the middle behind the behind the diagonal parkers. Sometimes two lines. Unparking becomes problematic. But we arrived early and earlier, so did well. On first arrival, the lavender wasn’t as full yet as it had been where we’d visited earlier down nearer the villa, but it was making a gentle show in front of the abbaye. When you arrive on the entrance trail, you can go down the left side of the abbaye toward the back, and, perhaps, trails that wend farther along through the canyon. You can go right, toward what looks like “civilization,” in other words, people heading into the one lavender field out front where you’re permitted to walk among the lavender, into the gift shop, into the restrooms, into an area where you can get a tour of the abbaye. I’d love to take the tour, but on the Internet, it warns that silence must be observed (can do), no wheelchair or handicap access or people with other limitations (a bit of a red flag goes up: steep stairs with no hand rails? possibilities for falling off balconies? very rough cobblestone pathways? the dreaded metal spiral see-through staircase visible on the outside of one of the buildings?). And the capper: NO TURNING BACK ONCE YOU’VE BEGUN THE TOUR. I require an interview with someone who has taken the tour and is cognizant of all those little deterrents before I venture forth on it. I pass a couple of photographers. I find an old split tree, gardens, a gardener plowing, a path off into the woods. Abbaye de Senanque is a Cistercian monastery. It was built centuries ago. The monks live under a vow of silence and visitors are asked to keep their voices low and not to engage the monks in conversation. But they also have accommodations here for visitors, so there is at least one monk who handles matters requiring conversation. Off this courtyard is the chapel. It is supremely simple, as befits this order of monks, from the architecture to the glass windows and the furnishings. Back in the lavender fields, either people don’t read these languages, or don’t understand symbols, or just won’t be deterred. You’d think it might give pause. Visitors are extremely fond of taking photos of their friends or family members squatting down between the rows so the lavender appears to engulf them. These pairs caught the mood of color and isolation. The man and woman took pictures of each other in every nook and cranny of the abbaye, and enlisted passers-by to take their photo together. My happy mental scenario is that they are newlyweds. In a supreme act of faith, Sister and Brother-in-Law stick their outgoing mail in this stone pedestal which claims to be a post box. I hope the mail goes to other than the Lord. 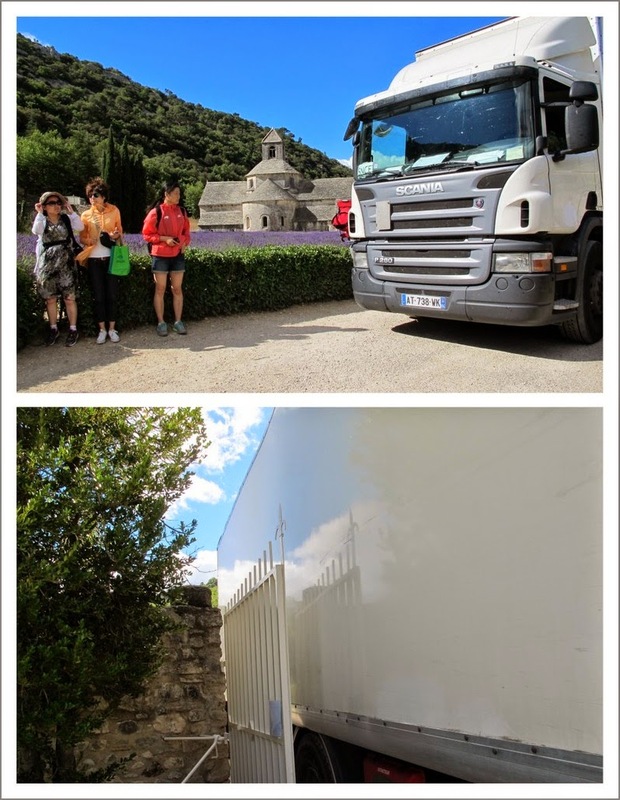 On our second visit, with an entire new group on the lavender tour, one of the first things I hear as I walk toward the abbaye is the sound of machinery. Men At Work, one of my photo topics. Way across the field I can see him, mostly hidden behind a row of trees, plowing back and forth. One of our group is disappointed that the monks don't hand till the fields. Copious numbers of visitors flood the premises. There is even more need to let a steady stream of delivery trucks pass through the premises. It’s a tight squeeze for some and I find myself sucking my stomach in as if that would narrow the truck a little. The abbaye sits stoically behind the lavender and big clouds skitter across the sky on a day that’s warm when the sun comes through, but cool when in shade or the sun is behind a cloud. Beth offers to take my photo in front of the abbaye. People continue to throng through the lavender. I take off again down the left side to a peaceful little area with a beautiful statue of the Virgin Mary. We’ve all been asked to submit 10 photos on the photo tour to be put on CDs for each of us as mementos. I know the Virgin will make a beautiful photo if I can get blue sky behind her to contrast with the white. I’ve seldom, if ever, seen anyone else here looking at the statue, nor taking its picture, which surprises me in a putatively Catholic country. I would imagine there are a lot of Catholic visitors. This is not the exact shot I used for the CD. The monk communicator is talking with another visitor. Two of our ladies ascend the steps from the courtyard of the chapel. Our visit is reaching an end. See you if I ever get on the internet again! You seem to have had the perfect weather for it! And never fear, somewhere, there will always be internet! I remember some 8 or 9 years ago, screaming down the hill behind the abbey on a bike (sort of terrified at my own pace) and coming across those fields and the abbey. It was one of those unexpectedly beautiful moments that stays with you (though it was in May, so prebloom time and also preseason time -- completely empty then). I have yet to discover how to find free random internet places. I need to learn that. I was nursing that bunged-up face in Aix-en-Provence when I drafted this, embarrassed and a bit sore to wander around among the holiday festivities (14th juillet) learning about public internet. The public internet in France doesn't always feel so public -- it often is limited to people who have an account, say with Orange. Or it requires that you have a cell phone where they'll text you a password. What works for me is a cafe. Most of them have WiFi now and I find it so enjoyable to sit in one with my computer. But, having said that -- it would be difficult in Aix because Aix is so crowded. So you feel sort of conspicuous with a laptop. In any case, unless you're a nut like me, you can certainly post after the fact -- it's still plenty enjoyable for us, the readers! The big point of it all . . .
Come visit a quarry . . .